Next generation clean technology buses are seeing healthy early-adoption rates across the nation in cities and towns of all shapes and sizes according to new data from CALSTART. Breathing Easy: A Survey of Zero Emission Buses Across America shows 1,650 electric and fuel cell buses currently or soon-to-be in use across the nation, representing 2.52 percent of all buses in the country. The top dozen early adopter states include California (877), Washington (154), Florida (70), Indiana (66), Illinois (61), Colorado (44), New York (29), Pennsylvania (27), Texas (24), South Carolina (22), Georgia (21) and Kentucky (21). This survey represents the first accounting nationwide of Zero Emission Buses (ZEBs). While it’s not surprising to see a ZEB in major metropolitan cities like Los Angeles, New York, Denver, and Miami, CALSTART’s new data shows ZEBs are also starting to show up in medium and smaller cities as well as rural communities. Examples include Fresno County, California as well as Lexington, Indianapolis, Flint, Chattanooga and Madison. In California, HVIP offers fleet owners deep and immediate discounts on clean vehicles. Developed in a unique partnership between CALSTART and the California Air Resources Board and administered by CALSTART, the program has helped put more than 3,500 medium- to heavy-duty clean vehicles on California roads. 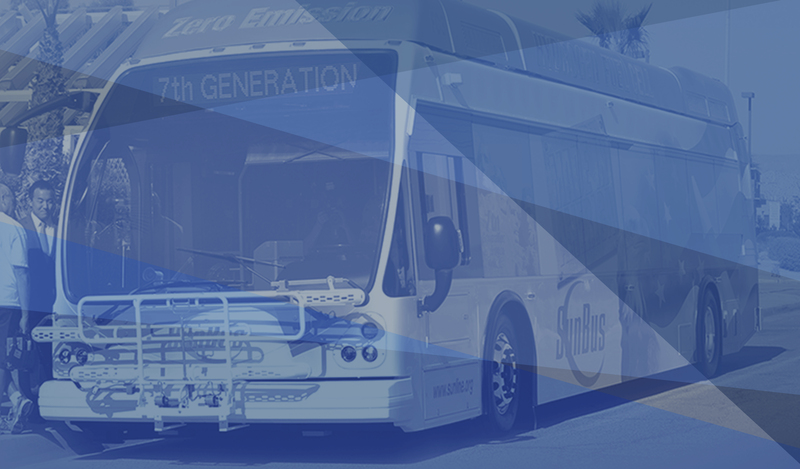 The Transit and Intercity Rail Capital Program (TIRCP), and a plethora of grant programs offered by the California Energy Commission and local air quality districts also contributes to California’s large market share of ZEB buses. Public health, economic and climate concerns all drive the shift to ZEBs. When burned as fuel, diesel produces pollution like black carbon, carbon monoxide, and nitrogen oxides (NOx). While bus riders create less pollution per capita than car drivers, they are much more likely to be exposed to unhealthy air. ZEBs also make economic sense. The total cost of ownership of a ZEB can be equal to or less than the cost of owning and operating a diesel engine bus, depending on the vehicle miles traveled. Electric drivetrains are more efficient than diesel and ZEBs. They tend to have fewer moving parts and therefore lower maintenance and service costs, although the sticker price is higher. Transit operators get the fuel for ZEBs from regionally produced sources, which have the benefit of keeping transportation energy dollars in local communities. Many ZEBs and their components are manufactured in the United States. Finally, ZEBs help reduce harmful greenhouse gases that contribute to climate change. As an unbiased technical, funding, infrastructure and implementation expert, CALSTART is accelerating the growth of zero emission bus programs across the country We are eager to share our expertise with fleets, transit agencies and public leaders hoping to better understand and adopt this new technology. If you are interested in learning more, please contact Elliott Popel at epopel@calstart.org. A national nonprofit consortium with offices in New York, Michigan, Colorado and California, CALSTART partners with 200+ member company and agency innovators to build a prosperous, efficient and clean high-tech transportation industry. We knock out barriers to modernization and the adoption of clean vehicles. CALSTART is changing transportation for good. This survey tracks ZEBs that are in use, on order from the manufacturer, or planned to be ordered by the local transit agency.